So the rain didn’t stop and the game got cancelled last night :( It was a bummer, but that’s okay, because I wouldn’t want to sit out in the rain anyway. However, it did get rescheduled for Monday night, and the dance is still tonight! I’m anxious to get all dolled up and have fun. Last night I saw Where the Wild Things Are with the ‘rents. It was interesting..cute, but very random. ‘Twas completely different than what I was expecting. There was definitely deeper meaning in the movie, it’s just a matter of sorting it all out. But it had good morals overall and the little boy is such a cutie. Well that’s it for right now! Check back tomorrow for hc pictures! aw so sorry the game got cancelled! major lameface - at least you still get to get all gussied up for the big dance. I expect to see pictures! I have been getting super nostalgic recently -- especially thinking about high school. These are some of the best years of your life girl - as cliche as it sounds.. live 'em up! i am so jealous you saw where the wild things are! ahh i really want to see it :) i loved that book when i was a kid. ahh can't wait to see the homecoming pictures!! 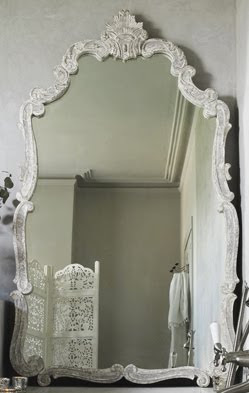 OMG we have the same crave, I've wanted an antique framed mirror for the longest. And I miss the easy Barbie doll days too.